La Grece et ses Isles Pour le Voyagedu Jeune Anacharsis. 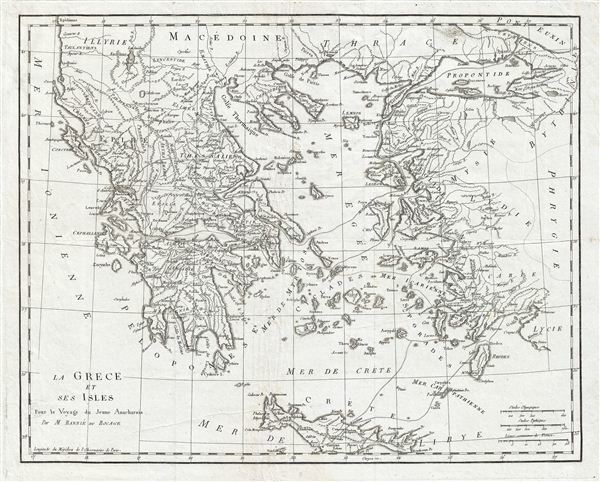 This is an attractive 1791 map of Ancient Greece. It includes Crete, the islands of the Aegean Sean and the parts adjacent Turkey. Take from the early D'Anville map. Notes important cities and towns along with various other topographical features. Following the Battle of Corinth in 146 BC, the Greek peninsula came under Roman rule. The period from 31 BC and AD 180 in Greek history is described as the era of the Pax Romana. This was a period of peace and security when many Greek cities flourished, leading to cultural and economic progress. After the fall of the Western Roman empire, Greece became the center of the eastern Roman or Byzantium empire. However, following the conquest of the capital city of Constantinople, the Byzantium empire fell to the Turks in BC 1453. Greece would be under Ottoman rule for nearly 1,000 years until the Greek War of Independence in 1821. Prepared by M. Barbie de Bocage in 1791 to illustrate the Travels of Anacharsis. Very good. Original platemark visible. Original fold lines visible. Blank on verso. Dark clean impression. Minor creasing.